The Cumberland & Dumfriesshire Farmers Mart had forward 414 head of ewes with lambs at foot at their sale at Longtown on Tuesday 28th June, 2011. All classes met the dearest trade of the season. Top of £86, £85 and £81 for Texel hoggs with singles from R.J. Muir, who also sold Suffolk cross with singles at £85 and £81. Greyface hoggs with twins to £71 from Knells Farming. 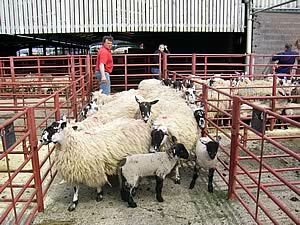 Shearlings with singles to £74 for Texels from R.J. Muir. Shearlings with twins to £69 for Texels from R.J. Muir.